I saw this over at the Yanko Design Blog. A very clever solution to a problem that I think we all probably experience, but don’t really consider fixable. 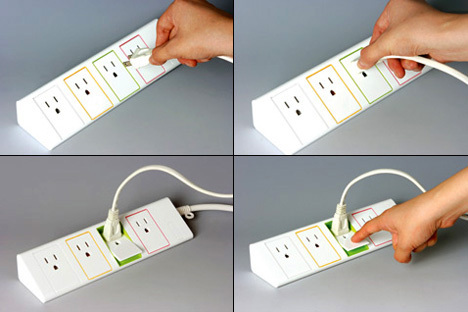 Raise Me Up is an electric powerstrip designed to make it easy for one handed operation. Normally you would have to brace a powerstrip with one hand while pull the plug with the other. Raise Me Up uses a simple lever switch to connect and disconnect plugs. i really freaked out when i saw this, i think it’s awesome. I’m always reaching under my desk with one hand and trying to unplug stuff with my index and thumb while bracing with my other fingers, probably getting carpel tunnel and risking electric shock in the process.